A grandmother's "painful death" from cancer could have been avoided, the health ombudsman has said. 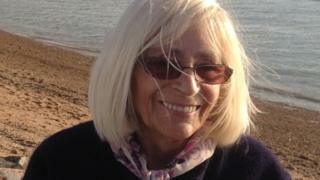 Pamela North, from Dagenham, died after a nine-month delay to diagnose bladder cancer, the Parliamentary and Health Service Ombudsman (PHSO) found. She would have had a 70% chance of survival if investigations had been prompt and proper, the PHSO said. But "inadequate and delayed" investigations meant the 73-year-old was not immediately diagnosed. Barking, Havering and Redbridge University Hospitals NHS Trust accepted it "fell short of the quality of care we aspire to". Mrs North was referred to King George Hospital in Goodmayes, north-east London, for urgent cancer tests in February 2015. PHSO said despite going for a number of tests which showed clear symptoms of bladder cancer, she was not diagnosed until January the following year. By this time the cancer had spread and her kidneys began to fail. She was treated with palliative radiotherapy in March 2016, but died two months later. "We found the trust failed to identify the cancer at an early stage and subsequent investigations were delayed and inadequate," the PHSO report said. "A prompt examination under general anaesthetic with biopsies being taken would have enabled the trust to diagnose cancer in March 2015. "The trust would have been able to give chemotherapy and radiotherapy treatment in March 2015 as the tumour would have been smaller and the kidney function better. "She would have had almost a 70% chance of surviving if she had been diagnosed in March 2015." The trust's chief executive Matthew Hopkins apologised to Mrs North's family "for the distress they have suffered". "We have made significant progress in the last two years since these events occurred. "We have made substantial improvements to our complaints-handling processes, to ensure we are thoroughly investigating and reviewing any area where we may have fallen short of the high standards we set ourselves."